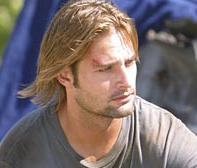 Josh Holloway, (Sawyer, to you LOST fans) has joined the cast of Mission Impossible 4. The movie should be out in December 2011. Nice getting “The Candidate” (The title of the show) out of the way right away. I thought this was going to be completely centered around Locke, and it turns out that it was Locke-centric, and throughout the show we found out how Locke got into that wheelchair. I thought it was interesting that in the “real” world, a plane crash on the island caused him to walk, but in the “sideways” world, a plane crash caused him to be confined to a wheelchair. Locke still blames himself for what happened to his father, so I’m not sure what the heck it’s going to take to get him to agree to it. Does the fact that John Locke in the sideways world knows how to fly a plane… does that mean that UnLocke does too? Don’t think so, but I thought I’d throw that out there. Did you notice that Jack had trouble with John’s dural sac? That’s the same thing he had to repair in a surgery in the “real world”. 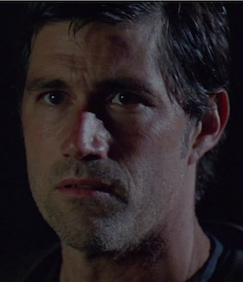 John’s near death experience had him speaking lines from when he was on the island: “You have to push the button” and “I wish you had believed me”. That second line made John pause when he heard Jack repeat it. Good seeing Bernhard again. I liked his “I hope you find what you’re looking for” line to Jack. I sure didn’t see bomb in the sub coming, but one of the people I was watching with did. I had wondered why UnLocke pulled that watch from the dead body near the plane (after he killed the guy), and it sure didn’t take long for an answer to that. Weird that UnLocke grabbed it before finding the bomb; he must have known it was there. Anyway, I thought it was great how UnLocke knew it would be human nature to try and tamper with the bomb, which caused it to explode. If only Sawyer had listened to Jack. Can’t say that I was surprised he didn’t, especially after Jughead exploded at the beginning of the season. There was no talking Sawyer out of that one. What’s with that wooden box? I mean, I know it had a mirror in it (which is a running theme this season), and it played “Catch a Falling Star”. Any other significance? Jack’s catching on to the coincidence of being on 815, big time. Not sure where that’s going to lead though. Sayid – There was some good left in him. Great way to go out, trying to save everyone. I’ll be sad to see him go. Apparently, Jack’s the one that’s going to end up being the new Jacob too. Desmond’s still OK. He’s at the bottom of a well, but OK. That’s where the survivors are headed next, I’m sure. Sun and Jin. Wow that was hard to watch. Great characters. My biggest complaint at the very end was that they cut to commercial a beat too quickly. More recalled lines: “What happened, happened”. edit: One more thing….Where the heck are Richard and Ben? Remember, Jorge Garcia is on Jimmy Kimmel Live tonight!